You are here: Home / City Hall / Why did Bob Bjerke get fired and what does it mean for Halifax? 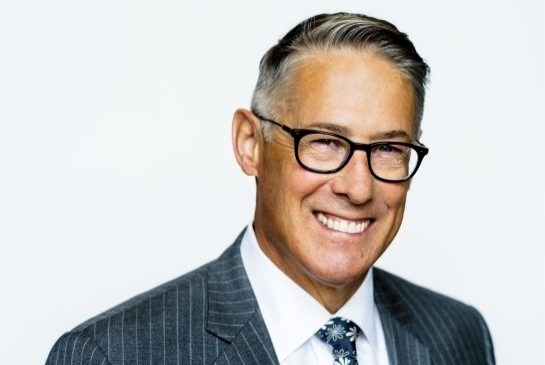 Jacques Dubé worked as HRM’s Chief Administrative Officer (CAO) for just 11 months when he decided to can the city’s Chief Planner, Bob Bjerke. Bjerke had been heading up the city’s planning and development department for about three and a half years. His dismissal came abruptly, with no explanation to either him, or to the residents of Halifax. In fact, only three weeks before he was let go, Bjerke met with Dubé to check in and see how he was doing with his new boss. Bjerke had been getting feelers from elsewhere, and wanted to make sure he was on solid ground in Halifax. Dubé told him he was. But then, somewhere over the course of the following three weeks, Dubé decided to fire Bjerke. Of course, high-level managers making six figures do sometimes get fired. Bjerke himself has been fired before, from his position of Director of Planning and Sustainability with the city of Regina. That was right before he got hired as director of housing in Edmonton, and then later recruited to Halifax to become this city’s first Chief Planner. 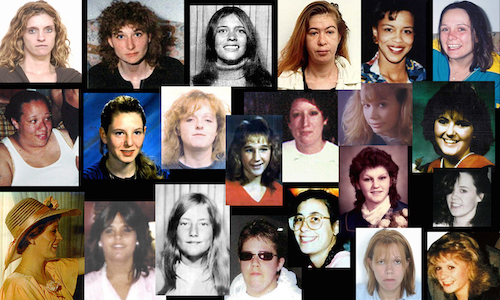 There’s a difference in how Bjerke was fired in Regina and how he was fired in Halifax. In Regina, city bosses immediately offered up an explanation for letting Bjerke go, citing a desire for “a change in leadership, a change in direction.” It’s not much of an explanation, but one thing it has going for it: transparency. The message signalled to the city there was a change afoot. Here in Halifax, we’ve been accorded no such consideration. CAO Jacques Dubé and city council have not given even the most basic public justification for the sudden firing of Bjerke, citing privacy issues. So we are left asking: Why did Bob Bjerke get fired and what does it mean for Halifax? By all accounts Bjerke was respected and liked. To everyone I’ve spoken to, developers included, the firing was a complete surprise. To this day, many planning staff simply have no idea why he would have been fired. Some people I spoke with had criticism of Bjerke. He could have communicated more (with developers, of course). The changes he was making didn’t happen quickly enough, or they happened too quickly. Bjerke could not, we know for certain, have been perfect. We also know that his job was not an easy one: to transform the way planning and development has been happening in this city for the past few decades. Bjerke was also the leadership behind the impending (fingers crossed) arrival of HRM’s Green Network Plan, which promises to define and protect the city’s parks, natural reserves, and green spaces. Since Bjerke arrived in 2014, city hall has been investing heavily in long range planning and operational reforms, but those efforts are still very much balls in the air, and Bjerke’s sudden dismissal is reason to worry that some of them might get dropped. The modernization of the planning department is probably the least understood (publicly) part of Bjerke’s job, though it’s a major part of what he was brought in to do. Bjerke says that process slowed down when new CAO Jacques Dubé was hired in September 2016. In December, a few months into his new job, Dubé sent around a memo requiring reports coming from committees and community councils go through the CAO’s office, meaning one more bureaucratic stop for even hyper-local planning considerations. Dubé also required that the legal and financial departments review all reports before they go to Regional Council, though that rule has since been relaxed. 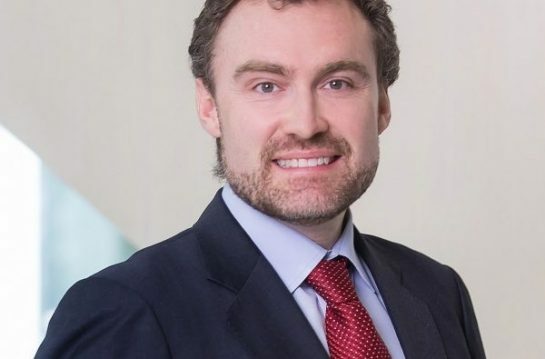 A few months later, Dubé announced that he was getting rid of the Deputy CAO position, which had been filled for the previous year in an ‘acting’ capacity by Jane Fraser, now HRM’s director of corporate and customer service. Perhaps Dubé is feeling the pinch in terms of workload these days, as HRM has recently announced an internal search for a “senior advisor to the CAO”. Everyone in there is going to do their best to continue doing their job. It’s just with the gap that gets created — it’s disruptive. There was a real program that was moving forward that’s going to get put to the side. You can’t help but have that, because that’s going to be affiliated with the work that I was doing to sort of modernize the department, to get faster applications, more clarity, more public involvement. All those sorts of things as far as anyone can tell, and certainly in terms of the feedback I’ve had, were what council wanted to see, and what ultimately the community wants. It’s possible that Dubé is not intentionally planning to derail the progress Halifax has made in long-range planning and procedural reform to date. But the signs aren’t good. First of all, it’s been three months since Bjerke was fired and there’s still no replacement for him — the city has yet to even put out a call for recruiting firms to work on finding a new Chief Planner (though I’m told staff are currently preparing a request for proposals). When he fired Bjerke, Dubé removed the main senior management support that had been powering everything from the Centre Plan to the Argyle Street streetscaping project. If Dubé, as he stated in his email announcement to Halifax staff in August, was planning for the vision “embraced by the Mayor, Council and myself,” to “continue to be embraced,” then why on earth hasn’t the city at least started to find a replacement for Bjerke, three months later? Secondly, there’s the latest development debate at council, in which an unsolicited CAO report asked council to reconsider a previous planning decision, against the previous recommendations of the city’s own planning department. 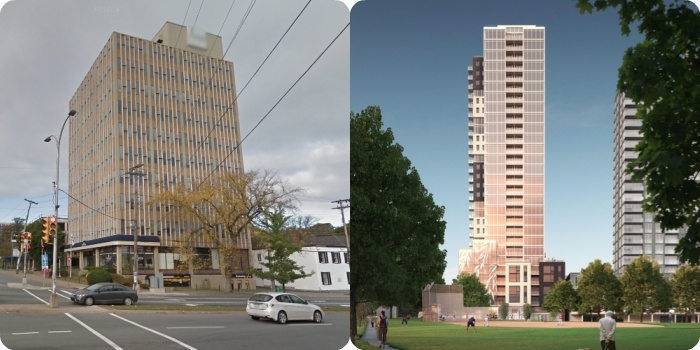 The debate was not about a new development proposal, but rather one that has already moved through the process and been approved to go to public hearing: the Willow Tree tower proposed for Robie and Quinpool. Some background: Two weeks ago marks the third time council has considered the height of the proposed tower at the Willow Tree intersection. Staff have been recommending a maximum height of 20 storeys since it was first proposed, because that’s the direction of the yet-to-be-codified Centre Plan. In September 2016, council overrode that recommendation (with councillors Watts, Nicholl, and Mason opposed) and allowed for a 29-storey tower to proceed. Six months later, after a motion from local community council, a newly elected city council reconsidered, and decided the tower proposal could proceed to public hearing but would need to max out at 20 storeys. Fast forward to this month. The agenda for council’s November 14th meeting featured an information item originating from the CAO’s office, communicating a sort of counter-proposal from George Armoyan, the developer for the Willow Tree site. The report details how the current Centre Plan-inspired height limit of 20 storeys would not work financially for Armoyan, but he had a counter offer: he would be willing to reduce the original 29-storey height down to 25 storeys, provided he is also allowed to shrink the required minimum size of their units by 25 per cent. Willow Tree site in its current state (left), and as seen in architect’s rendering (right) with a neighbouring tower that had been proposed by another developer. Typically, an information report is generally just that, for information purposes. Unlike other staff reports, information reports generally don’t include a section for recommendations to council, and information reports often don’t even make it onto the active council meeting agenda. Councillor Shawn Cleary took up the CAO’s call and moved to rescind council’s previous decision, ignore the direction set in the Centre Plan, and add five storeys to the Willow Tree tower height. (Item 13.1 in meeting video.) Ultimately, his motion failed to get the two-thirds majority needed to overturn a previous decision. Council does not appear to be changing course on planning direction, even if senior management is. This all raises the question: How could senior management bring on a change in direction without any direction from council? It’s possible Dubé doesn’t know he’s changing the city’s course. He was a hands-on city manager in Moncton — for example, personally taking over the management of the city’s mega-concerts right before they tanked — so perhaps he is just being hands-on with the planning department, with the intention of continuing to embrace the direction we’ve been going, but just not doing it well. But it’s hard to imagine that Dubé really believes that firing the Chief Planner —at the eleventh hour for so many major planning projects — was the thing that would help further the goals the department had been painstakingly reporting on and consulting over for the past three and a half years. The concern, according to Bjerke and confirmed by other development industry types I spoke with, is that the work that has gone into something like the Centre Plan (or the Green Network Plan or the Integrated Mobility Plan) actually goes “stale” if not implemented in good time. And regarding the Centre Plan in particular, Bjerke said “there’s a lot of heavy lifting” to come, what with the next step of writing a completely new municipal bylaw that will capture the ideas in the approved plan. So what’s at stake with the Centre Plan? In Bjerke’s opinion, and those of unnamed others I spoke to, a great deal. It’s not even so much about the details of the plan but rather about simply having the plan — a consistent, modern plan — to put an end to the ad hoc style of development that many developers and city planners are accustomed to. So what’s actually going to fit with a framework, what’s going to be where your transit goes? It’s a sort of strategic shift from that smaller “we’ll do things one-off because we are hoping for development” mindset, to setting the bar where you are going to get good development that really does contribute to the broader success in the longer term. Which is what the Centre Plan, regional plan, and all those sorts of bigger documents are about. It’s better for development, and economic development, to have the bar set higher. When you know that a high quality development is required, then you also know that the development that goes in next to yours is going to be of higher quality. If it’s ad hoc, you don’t really know what’s coming next. It’s important not to just deal with individual projects, because you can firefight on individual projects and get down into the details, and all that means is you will always have to do that. When you can fix the system overall that’s where you can make the progress. And as I say, we were about halfway through doing that. The way city hall has acted under Dubé over the three months since Bjerke was fired seems to indicate that continuing the process Bjerke started is not in the cards. It could be that the culture of how buildings get pitched, negotiated, and approved in this city is just too engrained, and the resistance to change too strong, to accept Bjerke’s reforms. Or it could be that those reforms simply lost the support of the city’s top administrator, just 11 months into his job. It certainly seems like the inertia of the old ways has won out, but anything’s possible, especially with elected councillors that appear to support reform, even if they did not support the reformer. Dube should have been fired for his behaviour in the Whitewood et al mess. Council spent 2 hours discussing him when 2 minutes was long enough to put and pass a motion to give him a T-4 and a pink slip. And the legal department continue to support the fiction that Chief Blais reports to Dube on ‘administrative matters ‘. The Police Act states the opposite and if the Justice Minister approves the new by-law HRM will be the only jurisdiction in Canada where a Police Chief reports to a CAO and a Board of Commissioners. Totally, strongly agree. Well said. Interesting, I always wondered how it was possible that so few people were at the Moncton Springsteen concert. There was zero promotion for that show. Sounds like Dube has some serious control issues.